If for some reason you still needed proof of Rian Johnson’s Star Wars geek cred, look no further. 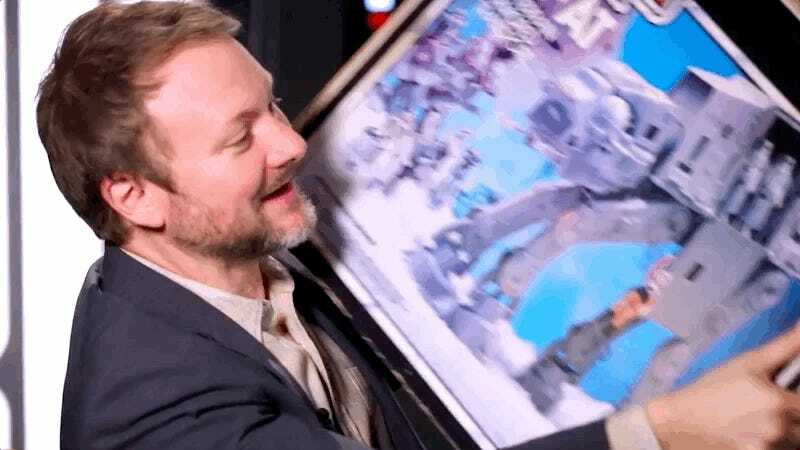 At this past weekend’s Star Wars: The Last Jedi junket, the writer-director was presented with his dream vintage Star Wars toy, The Empire Strikes Back AT-AT, still in the box. It was found by the Toy Hunter Jordan Hembrough (whose show is, sadly, no longer on the air) and filmed for the Star Wars Show. It’s cued it up right here. Come on, how cute is that? By the way, the rest of that episode is great too. For example, there’s Anthony Daniels helping some droids on the Canto Bight set of The Last Jedi (at 2:16), as well as the moment Oscar Issac was finally presented with the revelation that our own James Whitbrook has been screaming about for years. But Johnson getting handed the AT-AT, then carrying it out of the room, is the highlight. And let me say, I was at that junket (have you read my interview yet?) and saw Johnson walking around still holding the large box. That smile was still spread across his face long after leaving the interview. “I got the AT-AT!” he exclaimed to the on-lookers as he headed down the hall. For more of our Last Jedi coverage, visit the below links.